Only pay interest? Are you crazy? That’s what I said when I first heard about the interest only mortgage. I have never liked debt and always assumed that paying debt down was the sensible thing to do. And I still believe paying down debt is the right thing to do. During my time as a mortgage banker the interest only mortgage was a popular product. In some cases it was the only loan I could do for someone to buy a home or refinance a mortgage. At the tail end of my mortgage banking days they started to go away and might be gone for good. It took me quite awhile to understand why interest only mortgages were such a great loan. If you are in one or if they ever come back then I’ll do my best to explain why you may want one. These loans were available in adjustable or fixed rate terms with monthly payments calculated over 30 years just like regular mortgages. During the first 10 years of the loan you have an interest only option period. What this means is during the first 10 years you are only required to make interest only payments. After the 10 years is up, the loan will turn into a 20 year fixed loan where you are required to start paying down the balance. If you are still in the loan after 10 years your monthly mortgage payment will go up considerably when it turns into a 20 year fixed rate mortgage. In many cases it will go up hundreds of dollars. Interest only loans have interest rates that are typically .25% higher than a normal 30 year fixed loan. This is because the bank is not getting the principle you would normally be paying back which in turn they lend back out. To get more money coming back to them they charge a little more interest. Ask your lender what the difference in costs would be to get the same available interest rate as the 30 year fixed. It might cost a little bit more because you would be “buying down the rate”. Not Paying That Much Principal Already – Take a regular 30 year fixed rate mortgage of $150k at 6% for example. Your monthly payment is $900 of which $750 goes towards interest and $150 goes towards principal. Not a whole lot going towards paying down the balance, huh. In a regular 30 year fixed rate mortgage you really don’t start paying more principle than interest til year 15. And it’s because those mortgages are front loaded with interest. You could say a regular mortgage is interest only because you pay so much interest in the beginning. Would keeping the $150 a month you’re not paying towards the mortgage help with other monthly bills? But You Can Always Pay More – You are only required to make the interest only payment. If you want to pay more every month than do so. Anything above the interest only payment will go towards the principal balance. Dropping Payments – One of my favorite features of the interest only mortgage was if you did pay more towards the principal balance the required monthly interest only payment would re-calculate the following month. Regular mortgage payments do not adjust if you pay more. Those have the same payment til the day its paid off. Not so with interest only mortgages. Throw an extra $100 on top of your interest only mortgage payment one month and see next months interest only payment go down. It will not be a lot in that instance but it will go down. Might Not Have To Refinance Again – The #1 reason why people refinance is to lower their payment. Since you have the lowest required monthly payment already, there might not be a reason to refinance unless you can save interest and get into another interest only mortgage. This will save you a couple thousand dollars in closing costs from doing a new loan. 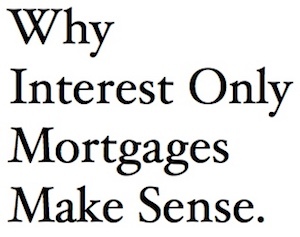 Some people get confused with interest only mortgages. I have heard of people closing on one, making a payment or two, notice their balance is not going down and then call the mortgage company back raising hell saying they think the bank never wants them to pay the house off. Turns out they got so focused on the payment being lower than anything else they were hearing while doing their shopping they did not hear it was interest only. An explanation or two has had to happen which is all good. In many cases they were happier than before after hearing the benefits of the interest only mortgage which is the interest only payment. When you get your mortgage statement you can throw additional money on top of the payment or not. It’s up to you. The biggest reason people refinance their homes is to lower their payments. So instead of throwing that additional $200 towards the balance this month just keep it in your pocket. After 3 months that’s $600 in your pocket and you do not have to pay thousands of dollars to refinance your loan to take cash out. The interest only mortgage gives the borrower security in a fixed rate mortgage, the option to pay down their mortgage, and be able to see their payments slowly drop with it. What savvy borrowers do with their interest only mortgage is make what a normal 30 year fixed principal and interest payment would be so their payment would not change in ten years at all.